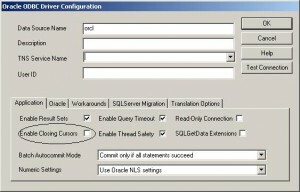 If a “ORA-01008 Not All Variables Bound” error is displayed, this could probably be related to oracle bug 5254759. This could be solved by upgrading to 10.2.04 or installing the interim patch. 3) In the application tab, check the “enable closing cursor” checkbox. It is important to note that this solution may not always work and it will probably result in a notable performance reduction but it may help until the patchset is applied. 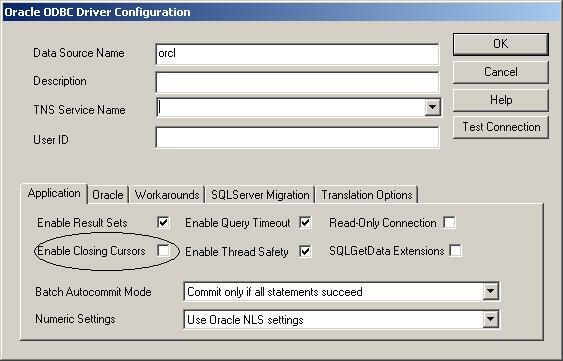 This entry was posted in Oracle and tagged ora-01008, Oracle on September 16, 2008 by Asaf Tal.